I recently gave a short presentation on the topic of food security against the sobering historical backdrop of the National Famine Commemoration in Skibbereen. Could we ever see a situation again in which we failed to feed people? Having committed to giving the presentation I was forced to do some research and sift through what it might mean for West Cork. The result is a discomfort that continues to gnaw on my mind. The threats looming over our food supply this time are not disease and over dependence on potatoes nationally but climate change, overpopulation and the looming scarcity of oil globally. I don’t yet believe that we will struggle to acquire the calories we need to live, but the quality of what we eat will be radically affected. Our ability to feed ourselves and our families a balanced diet with fresh food, particularly fruit and vegetables, will be more and more dependent on income. Just as the potato famine hit a particular social class, so too will issues like obesity, heart disease, diabetes and certain cancers become increasingly associated with income. Even staples like wheat and rice are under serious threat. The vast majority of the cereals we eat arrive to us from drought affected areas like central USA, northern China, central Europe and Australia. Countries like China and South Korea are running out of arable land and water, and have already started a global land grab, buying up millions of hectares for growing in countries like the Philippines and Madagascar. My first question in exploring food security is how successfully are we feeding ourselves at the moment? Not very well, is the answer, in fact 96% of our farmland in Ireland is devoted to feeding animals not people – 80% is under grass and 16% produces fodder crops. Yes, that gives us meat and dairy products, but it is generally accepted that we should get 75% or more of our diet from plant based foods – cereals, vegetables and fruit. We don’t produce these in anything like the quantities we need. Our most valuable vegetable crop is the white mushroom – near tasteless and not required in large volumes for a healthy diet. In reality, it is the supermarkets that feed the vast majority of Irish people, not our farmers. And of course there is a reason for that. Supermarkets do a very good job of stocking a continuous variety of fresh food at affordable prices. They buy in volume to keep the price down and they have immense distributions systems to source food from all over the world and so ensure continuity, so far. The result is that they also very successful in deciding what gets grown by our farmers. Last month 30 potato growers stormed a Tesco managers meeting in Ashbourne, Co. Meath, angry that their produce is being displaced by British potatoes. We can be fairly certain that despite the determination of these growers to address the situation and stand up to the supermarket, unless they have another route to market they are likely to plant less for us to eat next year. We were delighted to welcome the Minister for Horticulture, Trevor Sargent TD, to our offices in Clonakilty last month, and I put it to him that we needed a horticultural revolution if we are to seriously address food security. Whilst he agreed with the need, he sees the supermarkets as a major stumbling block in expanding output. The growers, he says, are in hock to the supermarket buyers. He has feedback that horticulture grants attained by growers to help improve their efficiency and expand the sector are quickly followed by phonecalls from buyers asking them to drop their prices further now that they have the grant. There is only one winner in this system. Although we are lucky enough to have some notable exceptions in West Cork, there are very few supermarkets around that do not exploit this inequality in the buying relationship. We need more locally owned independently minded stores that will actively foster smaller local growers. The irony is that just as the famine destroyed not just the landless, labouring class but also bankrupted many of the landlord class, so too will food and oil scarcities hit not just the poor in our society, they may also collapse the supermarket empires which are so dependent on oil. If they can’t provide cheap, fresh food their proposition becomes less compelling, especially if we have to travel further and further to reach our nearest supermarket. The latest Tesco Extra stores have extended the expected customer travel radius from 20 miles up to 30. Within the next few months we will witness a savage price war among the multiples – there is huge overcapacity, the growth in the number and size of supermarkets in the last 5 years has far outstripped population growth and has resulted in more shelf space that we can support. There will be closures within the next 12 months. The Greens are particularly strong in backing the grow your own movement and launched the Get Ireland Growing campaign in March – see http://www.getirelandgrowing.ie. As a movement “Grow Your Own” is really gathering momentum and was greatly helped to move into the mainstream by Corrigan’s City Farm. Even the Obamas have dug up some of the White House lawn for their “Victory Garden” (smug note: Mary McAleese has grown veg and even kept hens at the Áras for years now). The term “Victory Garden” refers to the wartime and post war dig for victory movement in Britain, when the country managed to grow 40% of its food in back gardens and allotments. Almost every town in West Cork has plans to develop allotment gardens, with Bantry leading the way, being recently joined by Bandon. You’ll hear more about this here because I have signed up for one myself and will be getting going next Spring. I know that food security is not the primary motivation for most people to get growing, there are much immediate rewards to do with wellness, learning and enjoyment. But grow your own could be the basis of the revolution we need in horticulture, creating demand for local veg to supplement our own produce and skills for local growing that may turn commercial. So, can we feed ourselves? I hear the rallying Obama chant of “Yes we can” but I’d have to add, not yet. 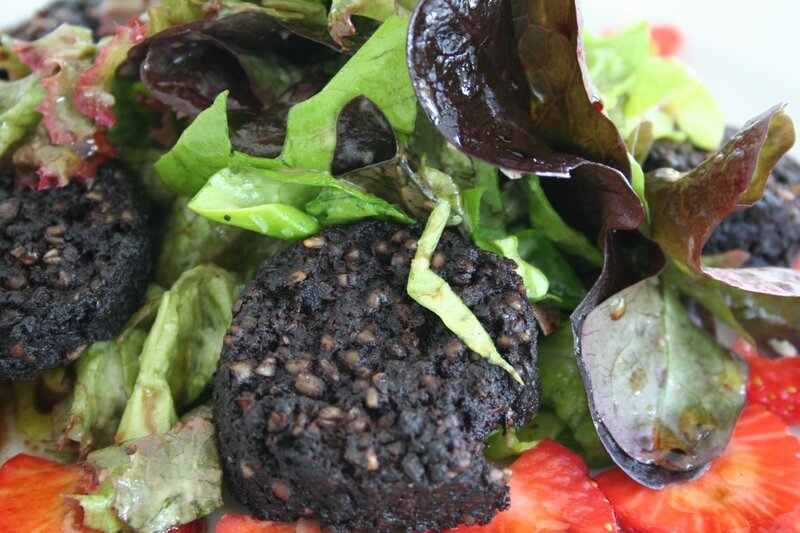 Despite our acclaimed cheeses, seafood, preserves and other artisan foods, traditional black pudding is the food product most associated with West Cork. I know this because we at the Fuchsia Brand do fairly regular surveys to gather information from visitors and shoppers about brands and foods they associate with West Cork and Clonakilty Black Pudding comes to mind most frequently. But I suspect that many people’s experience of West Cork black puddings stops there. Does this matter, I wondered? Are all puddings much the same anyway? This week, with the help of my 7 colleagues I set out to fill in a few more of the blanks on my culinary map of West Cork. We tasted 5 local puddings all of which are made with fresh blood. This was our first such office tasting session and I was quite surprised at the enthusiasm with which my colleagues devoured the plates of lightly fried black pudding, each keeping one hand free to scribble notes on the tasting sheets. I had thought that asking people to eat 5 pieces of black pudding unaccompanied would be a strain, but in fact they would have eaten more. Like wine tasters who don’t spit, a few of my colleagues were later to rue their over enthusiasm and will perhaps feel less compelled to eat every morsel next time. Black pudding in West Cork is made with blood from either pork or beef, minced meat trimmings, pinhead oatmeal, onions and spices. The oatmeal is left to steep in the blood before the other ingredients are mixed in. It is then filled into casings and boiled gently for 20-30 minutes until is has firmed up sufficiently. Cooking requires careful judgement, overcook it and you end up with a pot of mush. The blood firms up fully as the pudding cools. Unfortunately, nowadays almost all of the black puddings on the supermarket shelves in Ireland are made with reconstituted powdered blood rather than fresh blood, generally sourced from Holland, this can result in a grainy, crumbly texture. The fresh blood has a better aroma when cooked and a firmer texture. Butchers puddings are ususally made from beef blood because they do not slaughter very many pigs. Sheeps blood can also be used. Amongst the 5 we tested, Stautons and Rosscarbery Recipes use pig’s blood. Of course, black pudding is not unique to Ireland, but appears in different forms all across Europe. It is one of the oldest known cooked foods and t is believed to have been invented by the Celts. Black pudding or blood sausage can rightly be called a heritage food for the manner in which distinct and well respected regional variations have survived. In Germany it is called blutwurst and is often served with mashed potato. In parts of Germany it can be made with horse meat. In Spain it is called morcilla and can include other fillers such as rice, breadcrumbs, pine nuts, almonds. There is even a sweet morcilla from Galicia in the northwestern region, which is fried and served most commonly as a dessert. French black pudding is called boudin and the Confrérie des Chevaliers du Goûte Boudin (Brotherhood of the Knights of Blood Sausage) in Mortagne-au-Perche, Normandy holds a annual contest of international blood sausage specialities. This is the newest of the puddings we sampled and its creation is a very positive indication that the decline in fresh blood puddings can be reversed. Made by Willie and Avril Allshire of Caherbeg Free Range Pork, Rosscarbery, this pudding was best of the Irish entries at the aforementioned International Black Pudding Competition in France this year. It has a lower oatmeal content than the other four resulting in a softer texture. The flavour is full and well balanced with the meat holding its own against the salt and spices. This pudding is sold in plastic wrapped chubs and when cooked without its casing holds together well. Rosscarbery Recipes is sold in quite a number of supermarkets and butcher shops. O’Neill’s black pudding is sold only from their butcher shop in Clonakilty and is probably the longest in existence among the five we sampled, having been created by Mike’s grandfather. Mike still buys his spice mix from a descendant of the man who used to work for his grandfather and made the original puddings. O’Neill’s is made in the traditional rings and packed in natural casing. It was the only pudding we sampled that is cooked in the casing, which some people enjoyed chewing on to savour the lasting flavour. It has a fairly open, coarse texture though it did not threaten to crumble during cooking. Although the pudding was quite salty, it was the clear favorite amongst my colleagues, none of whom had eaten it before but most of whom will now seek it out. If you haven’t tried this pudding before the first thing that strikes you is the size, being considerably wider than the traditional rings or the chubs made by most commercial manufacturers. Produced by James and PJ Collins pudding is made in a large size only – c.2 inches across and 18 inches long, and is packed in a plastic casing. It is sold in slices, either vacuum packed or freshly cut. James told me that their recipe was adapted from the process used by their mother at home – “At that time every house used to kill a pig and making the pudding was part of that. It was for home use but we knew how to make it then when we started the butcher shop. One thing that has helped a lot is the hollow tube knife for extracting the blood – it’s a very clean and contained process now.” The introduction of the hollow tube knife that James refers to has put the production of fresh blood puddings on a much sounder footing with the regulatory authorities and appears to significantly reduced the threat of losing this part of our food heritage. Another large diameter pudding, this one had distinctly more chew than the others owing both to the meat and the higher oat content. I’ve eaten this a few times recently as part of my weekend fry and have come to appreciate the balance it brings to a plate already overloaded with salty, fatty pork products. Dan told me that they launched their pudding 15 years ago at the Bandon Show and that the man who makes it learned his trade in Clonakilty. I found this a common feature among the butchers I spoke to and probably accounts for the high degree of similarity in West Cork puddings. There is usually one person employed for the task and he will have developed his skill elsewhere, the result is a high degree of cross fertilisation and consistency. Although it is produced in a large, modern meat factory, Stauton’s pudding is made in exactly the same way as the others we sampled and is quite a separate process to main production activity at the plant. The growth in demand for their pudding from supermarkets was actually the main reason Michael Staunton closed his butcher shop in 1985 to establish a dedicated manufacturing and slaughtering plant. Fresh blood pudding making, is a tight process in terms of handling the blood and meat and is very much tied with the killing of pigs. Stauntons could not have grown the pudding sales without this new facility. The business is now wholly owned by Barryroe Co-Op who took a majority shareholding in 1998, but the puddings are still made almost exclusively by Donie O’Callaghan who started with Michael Staunton in 1967. “These puddings have stood the test if time. Nothing has changed apart from some larger machines, which make the job easier.” When I asked Donie about how Staunton’s compares with other puddings he told me that not surprisingly he doesn’t really eat any outside of work, where he’d “be nibbling away at a bit all the time.” The pudding we sampled is sold in a three pack with white and brown pudding also included. Stauntons puddings are also produced in traditional rings in natural casing. It has a nicely balanced flavour and aroma that should suit most palates. If like me you’ve been spending long evenings planning your holiday you may find it reassuring to know that at your journey’s end there are dedicated tourism professionals who are also making plans at this time. And if you’re lucky you’ll stumble upon restaurants run by chefs that have the ambition and skills to serve you the flavours of their local produce. This week I dropped in to one such provider who was busy preparing her summer menu, Marie O’Keeffe, proprietor of the Emmet Hotel in Clonakilty. 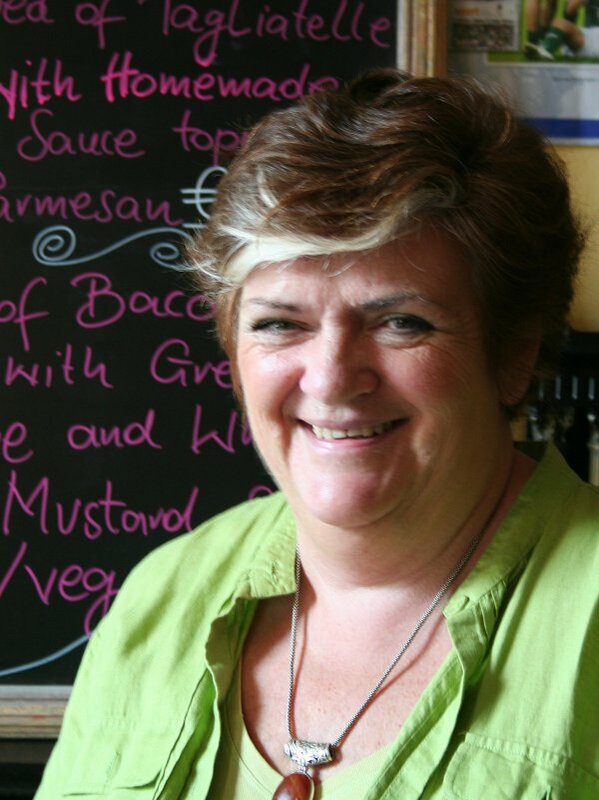 In keeping with these straightened times Marie is keen to offer great value and is introducing an evening meal deal comprising weekly main course specials with tea/coffee for just €10 or €12.50 with a glass of wine. In looking at changing her menu, however, Marie is clear about some things that won’t be changing. “The important thing is that even though we’re dropping our prices we’re sticking with our old suppliers that are still more expensive. Lots of restaurants are introducing value offers but they’re also dropping the quality of the ingredients. A lot of what they put out is muck. We’ve sampled meat from so many suppliers, they’re a lot cheaper but just not as good. We get all our meat from Dan Lordan in Ballinspittle and our fish from Ballycotton Seafood. The natural yogurt from Irish Yogurts gets a great reaction and visitors to Clonakilty always look for black pudding. There are great herbs and vegetables grown here and fruit too, like Bushby’s strawberries.” “You can buy in almost any dish prepared and just cook or reheat it straight from the van, but that’s not what we’re about. We make everything from scratch ourselves. For sauces and soups, fresh stock is particularly important. You can’t get the depth, the hidden flavours, from a sauce without real stock. I had a battle with a rep the other day who was trying to convince me to use Knorr bouillons. I said that all I could taste was the MSG. ‘But that’s what they want!’ he said. Maybe he’s right but you have to be true to your own standards.” Marie is a self taught chef and is pleased to share what she has learned when she finds someone whose delight in food matches hers. “If someone working here shows and interest in food I respond and encourage them. We’ve had 3 people so far who’ve begun working as kitchen porters and were clearly interested in cooking. We’ve supported them to go to college and become fully qualified chefs.” I managed to prize a few recipes and tips from her, though there are plenty of others that she’s unwilling to part with for now. “The summer menu will naturally be lighter but we’ll keep many of the dishes we’re known for. People like to try new things on holidays so we can be more adventurous during the summer. For example, we sell more offal during the summer. I absolutely love offal myself, particularly sweetbreads. Everything but the brain. When I started cooking in Cork city and later in London, we served offal to please the jaded corporate palate – people who were dining out 3 or 4 nights a week and wanted something different. Now people are rediscovering offal, it’s fashionable but also cheap.” The last recipe Marie gave me was for grilled goat’s cheese with honey, lavender and roast beetroot, a definite new addition. I don’t think I have ever tasted lavender as a herb and am salivating in anticipation of this one. So bring on the summer and bring on the menu! Roast the beetroot in the oven (180˚C fan assisted, 200˚C conventional) for 20-30 minutes or until soft. You can wrap each one in foil if you want as they bleed. Remove the skin and chop into cubes. Slice the goat’s cheese into 1” thick rounds. Place a sprig of lavender on top of the cheese and brush with local honey. Place under grill until slightly brown. In the meantime heat your beetroot in a tiny amount of olive oil. Place on plate and top with goat’s cheese. Bring to the boil and simmer for 1-2 hours. Skim occasionally. Strain and allow to cool before skimming off any fat. I don’t use carrot as it tends to give a stewey flavour, but not everyone in the kitchen agrees. If you want to get the sweetness of carrots, then sautee them in a drop of olive oil, cover and soften them in their own steam. Pour the stock into this to absorb the flavours at the end of the stock cooking. Rub in butter and bread soda to the flour. Add all the other ingredients. Bake at 180˚C for ¾ hour in 3 1lb loaf tins. Remove from tins and put back in the oven for another 10 minutes. Crubeens with White Pudding – boil gently for 2-3 hours until tender. Bone while still warm. Leave the toe bones in. Stuff with white pudding mixed with onion. Brush with garlic butter, roll in fine breadcrumbs and roast in oven for 20-25 mins (180˚C). Sweetbreads with mushrooms – soak the sweetbreads in water with salt for at least an hour to remove the blood. Then blanch and allow to cool slightly so that you can remove the skin. Dip in eggs and breadcrumbs. Slice and fry. Once cooked, add cream, mushrooms and perhaps a drop of sherry. Lambs liver with garlic – Lambs liver can be just as good as veal liver. Buy the liver in a large piece and keep in milk until ready to use. Fry it in butter in thick cuts. Once cooked pour melted garlic butter over the liver. Anthony Creswell from Timoleague is a committed smoker – no patches, no gum, no hypnotists instilling the mantra that smoking is vile and disgusting. Smoking is what he does and he has no intention of quitting. Such intransigence is not surprising when his smoking habit is rewarded year after year with acclaim at home and abroad for his range of smoked fish and meats – picking up Gold medals at the Great Taste Awards in 2008, 2006, 2005, highly commended as one of the Best Artisan Suppliers at the Irish Restaurant of the Year Awards in 2007 and winning an award from the Irish Food Writers Guild in 2007. Since the decline and ultimate disappearance two years ago of Ireland’s most prized delicacy – smoked wild salmon, Anthony has worked hard to maintain the Ummera Smoked Products reputation as one of the finest smokehouses in the world. I met Anthony at his smokehouse near on the banks of the Argideen River, 2 miles upstream of Timoleague. Before we get talking Anthony has to shoo his young daughters from the office and I reflect on how for many small food business owners there is very little division between their work and their “life”. This can be a problem for family life during the busy periods, like the lead up to Easter or Christmas for Anthony, or having to work at markets on Saturday and Sunday. But on this day the melding of the two worlds feels like a very positive thing. Whereas in most workplaces children are an intrusion, these girls are comfortable in this space, they know what their father’s work involves and he is available to them a lot of the time. Ralph, one of Anthony’s elder sons, has a strong interest in food. He is currently working at the Urru culinary store in Bandon, but enjoys working with Anthony from time to time. “He got started with me in the lead up to a busy Christmas and enjoyed it, so he stayed on. But I wanted him to get out and learn other skills. I’m not sure if it’s always a good idea to learn from your father. I did battle with my own dad for 15 years.” I can see that stacking the teacher-student dynamic on top of the father-son relationship just gives your father even more entitlement to tell what you should be doing. And yet Anthony has changed very little in the smoking process he learned from his father in the 1970s. “We use a brine to cure the fish and meats for a number of hours before smoking. The brine is just water, sea salt and organic sugar from Costa Rica. Most smokers use a dry cure rather than brine but it seemed to work ok for my dad and if it ain’t broke… We also stick with oak for the smoke, it’s more traditional than other woods like apple or alder, but if it’s good enough for the finest wines in France then I’m happy with that.” After brining the fish or meat is left to dry in the smoker for 10 to 12 hours before the fire is lit and the smoking begins. Anthony cold smokes in 6 to 8 hours, quite a short period. Chicken breasts and silver eels are hot smoked so that they are cooked through. There are no artificial preservatives or colours in his foods, the smoke forms a natural bacteria resistant barrier and salt is a natural preservative. Anthony’s casual manner belies a serious commitment to making his products the very best around. I recall several mornings spent at the smokehouse a few years back as part of a sensory analysis panel. Anthony used formal panel testing to get objective feedback on subtle adjustments he could make to his curing and smoking. Even after 30 years he is still motivated by quality. “It’s about producing something that people will enjoy and will come back for. There’s nothing better than someone coming back and telling you that eating your food made their day. One of the special features of our food, is that it’s not the same every time. Because it’s not factory produced there is variation from day to day and month to month. I get mad with bureaucracies obsession with standards. It leaves very little room for imagination. It must be quite challenging, even depressing, for start up food producers that are excited about what they’ve tried on a small scale. But when they step up to approved production they find that they are reduced to producing to a formula.” And yet Anthony has managed to master the world of standards whilst retaining his enthusiasm and imagination. To the best of my knowledge Ummera is also the only smokehouse in Ireland that has attained an export license for smoking both fish and meat – the full range comprises salmon, chicken, bacon and silver eel. Achieving this license status is a big undertaking for business of this scale and required significant investment in separating the handling areas for the different processes to ensure that there is no contact between raw and cooked foods, even down to controlling the airflow. We switch back from talking about toys to talking about food, and when I bemoan the loss of the wild salmon stocks, Anthony tells me that the silver eels have also all but disappeared. “The eel’s lifecycle is the reverse of the salmon. They breed way out at sea in the Sargasso and then make the long journey to come ashore here. They are opportunist in choosing a river system and don’t return to their roots. The stock of eels has dropped by 80% in the last 10 years or so due to overfishing of the elvers (young eels), pollution and global warming. The silver eels we buy are caught just as they are about to leave the rivers and migrate to sea. They are about 4-6 years old.” I begin to appreciate the scale of the problem when Anthony tells me that the Central Fisheries Board restoration plan for eel stocks will run over 90 years! And although I can see that Anthony will miss another of our heritage foods, I know that he will continue to engage, adapt and excel, with new foods, new stories and old skills. Bill and Sean have also been championed over the years by food writers, particularly recognising their refusal to go under in their legal battle with the Department of Agriculture. Almost all of their 2002 cheese production was seized when TB was found in 2 of the herds supplying their milk. This effectively shut down the business without compensation. Bill and Sean were able to prove in court that the cheese did not present any health risk but still the dispute dragged on for four years and six court cases. Despite their appeal against the seizure being repeatedly vindicated in court, they have never received meaningful compensation. It was only through an alliance with Newmarket Co-op that the pair finally got back to making cheese again, just in time for the recession! “You know this crisis has been coming for a long time. There’s no respect for money; it’s just another commodity to be traded. Did you know that 98% of currency transactions have nothing to do with commerce? It’s a demented game that has to end. That kind of playing with value should be illegal. Our trading relationships should be based on a respect for labour and a respect for real value. I know, for example, that the Sterling exchange rate is hitting food producers very hard; it would be so much steadier if the UK were in the euro, but they’re not. You can’t eat money, it’s the means of exchange not the end. I’m not against people being materialistic but we have to separate need from greed, everything has gone so bling. Getting rich and spending money doesn’t make you free. Marx said that real freedom comes from knowing what you need.” Bill suggests that this is where the sustainability movement has so much to offer in starting with meeting our needs now but not compromising the needs of future generations. Much of Bill’s character was forged during his involvement in the US civil rights movement and working with Dr. Martin Luther King in the 1960s. He has first hand experience of dramatic social upheaval. He understands how lasting success can be gained through non-violent methods and the destructive and equally enduring impact of violence. “I see that a lot of people are furious at what has happened. My great fear is that some people won’t have enough to eat, that old people can no longer heat their homes, that families can’t afford kids school books. The one bonus for Ireland is that the crisis is global so we shouldn’t lose our talent like before. Emmigration is not a great option, I mean there’s jobs in the Canadian Yukon! …I think we’re in a pre-revolutionary state. A major overhaul is needed but we have to ensure that it doesn’t turn to violence, we must steer that fury to non-violent change.” Bill is not averse to the idea of upheaval but it is people that he cares about not ideas. As a rural development worker, I love the simple dynamic that the countryside produces food for the cities. It is a natural geographic relationship between people and places that allows everyone to have their need met. We talk about positive solutions, our great food and natural resources like renewable energy. Bill returns to the quality of the milk on the Mizen peninsula. “I would love to get involved in establishing a Mizen dairy, a small up to date plant that could deal with the wonderful milk that’s there. The technology that we’ve been using to make our cheese has moved on a lot. I’d design it differently if we were starting again.” It’s not just the hardware that Bill wants to re-invent. “This big corporate model that Ireland chose to pursue in the 1960’s is inappropriate; it looks good on paper, lower costs etc but it’s less diverse and it supports fewer people. The same applies to farms, they’ve shown the negative impact of corporate style agri-farms in the US, particularly how it leads to the deterioration of land and community. The family farms we have on the Mizen employ more people and families have a long term perspective of passing on the land in good health to the next generation.” I look again at the jackdaws at the feeder, and ponder how we can help the many smaller, more colourful birds get to the peanuts – if only they could talk to each other! Bantry CSA – the Community Solution to Getting Your Oats? I have been interested for some time in a model of food production called Community Supported Agriculture (CSA) so I was delighted to find that a few pioneering souls are getting one going on the Sheep’s Head. Community supported agriculture is a relatively new socio-economic model of food production, sales, and distribution aimed at both reducing the financial risks for the producers and increasing the quality of food and the care given to the land. It is also a method for small scale commercial farmers and gardeners to have a successful, closed market. The basic concept is that a group of consumers make a financial commitment to fund the annual budget for either the whole farm or for an individual crop, in this way they become ‘members’ or ‘shareholders’. Most CSA farmers prefer that members pay for the season up-front, but some farmers will accept weekly or monthly payments. Some CSAs also require that members work a small number of hours on the farm during the growing season. Through LEADER I’ve spoken with quite a few farmers around West Cork about diversification and the biggest stumbling block is handling risk, particularly market related risks like who’s going to buy this and when? How much will they pay? How can I get it to them? Whilst most farmers are willing to trust themselves to manage the risks around production costs and output, the unknowns about the market are often too much and their experience is too limited. For commodities like beef, milk and cereals often the only market variable is price. By answering these market questions in advance and spreading the production risks, community supported agriculture could really be a way of getting a greater diversity into Irish agriculture. Achieving a greater range of production closer to the point of consumption has so much to offer West Cork from the point of view of food security, local economies, food miles and biodiversity. In July of last year the Irish government set in motion a review of food security on this island. This was in response to a move in the UK to increase food self-sufficiency from 120 to 160 days. It seems that if our time runs out we’ll be stuck with meat and butter as these are the only products in which we are wholly self-sufficient, sounds like the Atkins diet. Charlie liked the idea and helped John with talking to other local farmers that would be receptive and had the right land and skills. In the end two more Sheep’s Head farms, Stephen and Packie O’Donovan and Dennis Holland agreed to join the scheme. 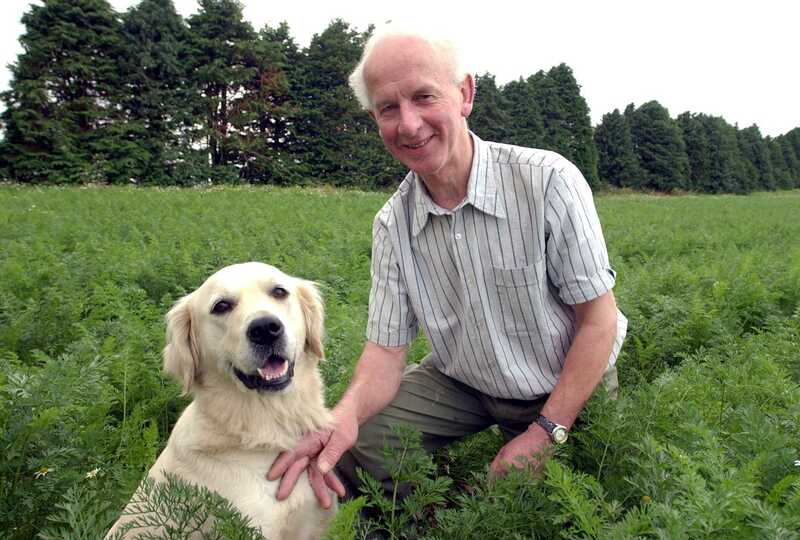 Stephen, who has featured previously in this column, and his brother Packie, will grow a half acre of Sarpo Mira potatoes for the group. Dennis will grow 3 acres of oats. Charlie is a fit man in his seventies and seems to relish the manual work that growing potatoes on a small scale involves. Despite our still cherished Celtic tiger notions of upperocity, I think that most of us have a sense that farming is good work. We hold close the notion of a meitheal or community gathering for collective work which is built on passed down memories of farm work that brought people together, such as at harvest time and threshing. Many CSAs draw people into aspects of the work on farm. One of the big challenges for Bantry CSA will be to develop the infrastructure locally for processing oats, which need to be dried, dehusked and rolled before they land steaming on the breakfast table. The group of 30 that buy into the oats CSA will need to invest not just their subscription but also some time and energy, though John has promised a harvest party after the threshing! My 6 year old daughter exclaimed in dismay as I threw the cooked ham in the bin this morning. She hates cheese sandwiches and it being Monday morning I hadn’t the imagination or energy to think of anything else. Something that would pass the lunchbox police at her desk who yuck at anything but ham sandwiches and cause her to bring her lunch home uneaten. But it’s total recall time when Minsters duck into the nearest phonebox and emerge with their underpants on the outside and a flowing cape on their shoulders. So whatever I may feel about over reaction by the authorities and a personal willingness to break the ban, I still couldn’t send my kids to school with PCBs. It’ll be in their bodies for at least 30 years longer. Conor O’Neill has got a bit of discussion going and it worth viewing for the rasher sandwich photo alone. The message going out is one of reassurance – we’ll be back on the bacon in a week – but will that be Irish bacon or the imported sort? It will take quite a while to test and reopen the pig farms around Ireland but the bigger concern is to reassure shoppers, keep markets open and not upset the Christmas dinner – that would never be forgotten.